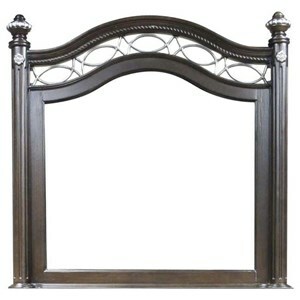 Treat yourself and your bedroom to this traditional dresser and mirror combination. 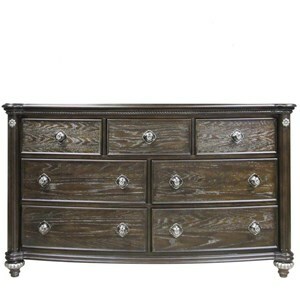 The beautiful deep espresso finish combined with the brushed nickel drawer handles adds an elegant flair to any room. 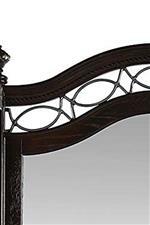 The attractive metallic accents on the mirror and the intricate lines and curves of the piece further add to its undeniable splendor. 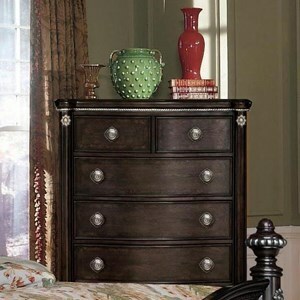 The top three felt-lined drawers are the perfect place to keep your most precious items. This practicality and the classic visual appeal of this dresser and mirror combination make it a prefect fixture in any bedroom. The Ventana Traditional Dresser and Mirror Combination with Felt-Lined Top Drawers at Morris Home in the Dayton, Cincinnati, Columbus, Ohio, Northern Kentucky area. Product availability may vary. Contact us for the most current availability on this product. 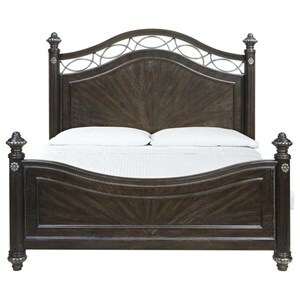 This traditional bedroom collection adds elegance and sophistication to a room. 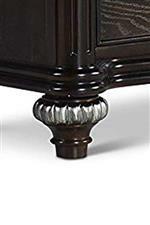 The wood's deep espresso finish with nickel highlights is captivating to look at. The unique curvature and rope twist design of this carefully crafted collection further demonstrates a refined charm. The felt-lined drawers are perfect for storing delicate and cherished items, illustrating how these pieces are luxurious on the inside as well. 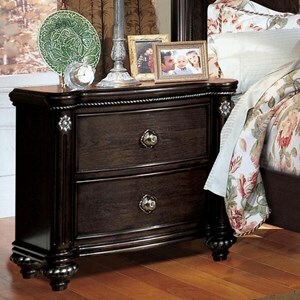 Give your bedroom the classic charm it deserves with this traditional collection. 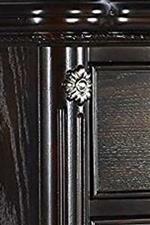 The Ventana collection is a great option if you are looking for Traditional furniture in the Dayton, Cincinnati, Columbus, Ohio, Northern Kentucky area. Browse other items in the Ventana collection from Morris Home in the Dayton, Cincinnati, Columbus, Ohio, Northern Kentucky area.